I’m loving distress ink watercolouring at the moment and it just seems to go so well with the Sarah Kay images. This one uses BasicGrey papers and embellished by cutting out the heart leafs from another sheet and giving dimension with silicone glue. 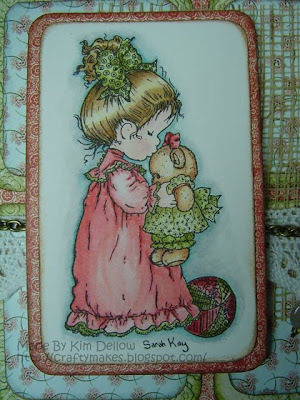 The metal hearts were coloured with alcohol inks and the lace with VersaCraft ink. 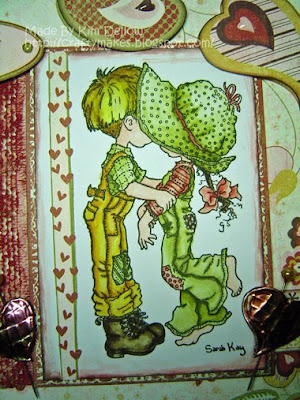 The sentiment is from Inkadinkado, the plaque and the corners are from Stamps Away. I might have gone a bit overboard on this one 🙂 No excuse – I just got a bit carried away. This card is heavy! Anyway I digress – the card also uses the BasicGrey Boxer papers and I’ve coloured the Sarah Kay image with distress inks, which is fast becoming my favourite colouring medium of the month. So I have finished my Christmas cards and not only that but they are all written and sent – don’t hate me! 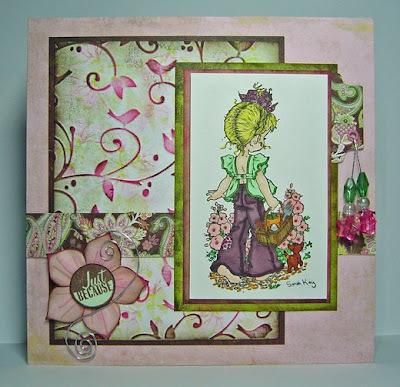 It was so nice to be able to do a ‘Spring’ Card. 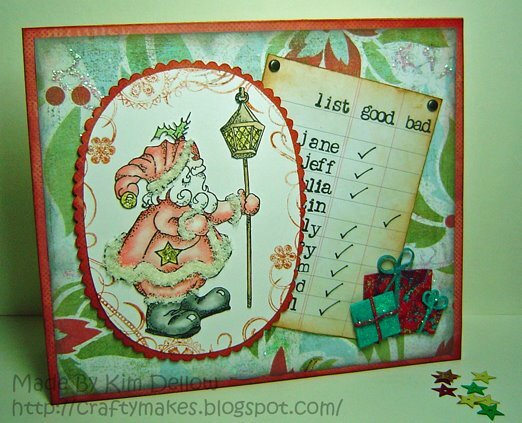 I really enjoyed making this card after all those Christmas cards. 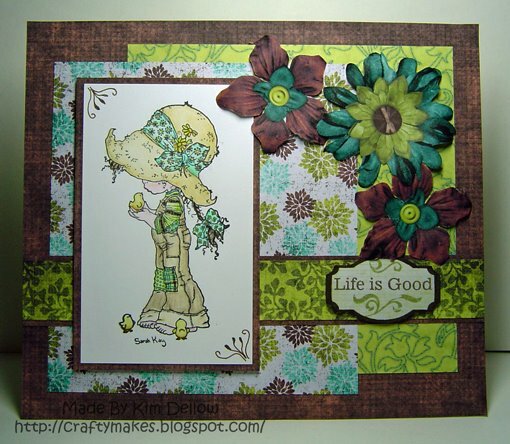 This one uses BasicGrey papers and the cute Sarah Kay stamp that I’ve coloured in with Distress inks. 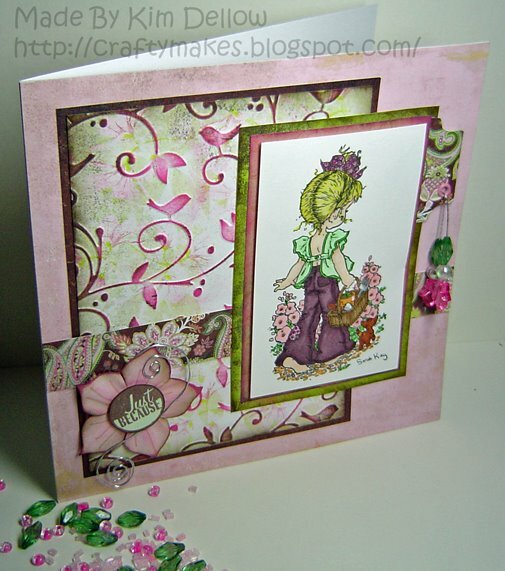 A challenge card for you and this one is for the Magnolia and Stampavie challenge blog and this week they have a sketch. 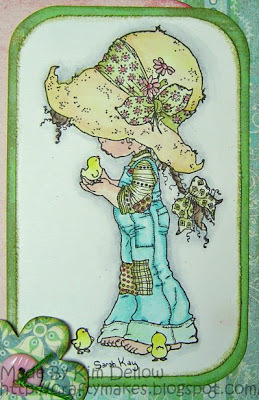 I’ve used the Spring Breeze Kit from Designs by Krista. I love the embroidery embellishments that come with this kit and I’ve used the little paper buttons as well and added 3D-glue to give the buttons a shine, not that you can see it in the piccy of course! A new Christmas card for you. It is difficult to pick a favourite piece, my thoughts change daily on the matter! But here is one I made a few months ago. 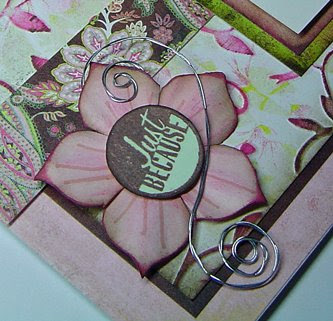 I love how the embossing works on the designer paper and highlighted with inks. Then there was the fun I had with the flower, wire, tab and beads as well. A card for the Sarah Kay Challenge blog, which this week has a Trio of patterned papers as the theme: you are only allowed to use three patterned papers, no more, no less. 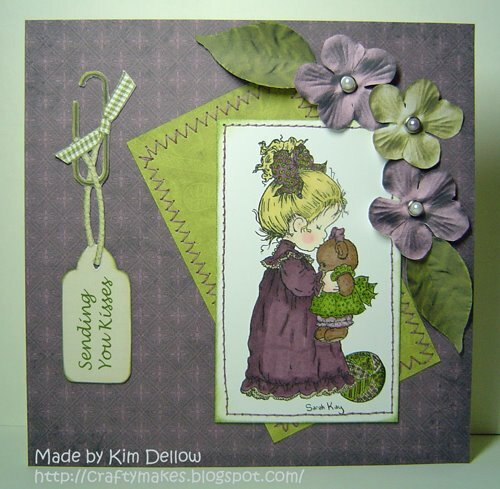 The papers are from Designs By Krista Flora kit. Another new challenge blog for me – the Sarah Kay Weekly Challenges. I’ve never taken part before but I thought I would give it a go this week with the purple and green theme they have and these lovely Designs by Krista papers. I have my sewing machine out at the moment so thought I would use some stitching. 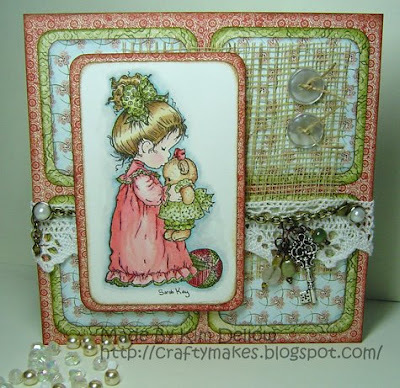 Another card using the the Sugar Pie kit from Designs by Krista. I’m honoured to be on another design team! Krista designs beautiful digital scrapbook papers, embellishments and kits and I count myself lucky to be on her design team working with these beautiful papers on card layouts. Krista’s shop is called Designs by Krista and she also has a blog. 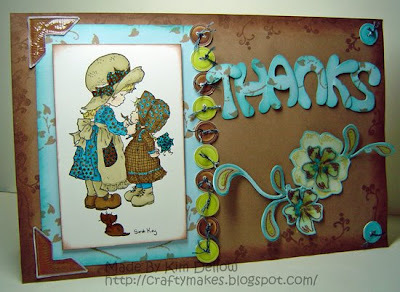 You guys should go take a look– the downloads are really easy to use and look fab on cards and scrapbook pages. 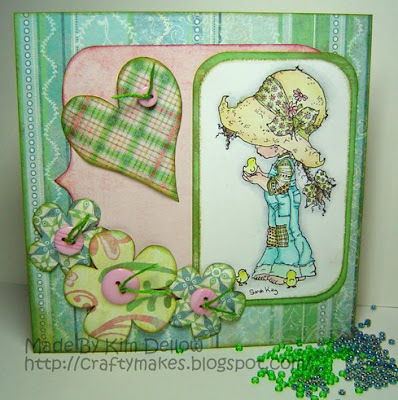 Here is a card made with Krista’s Sugarpie kit. Katharina is setting up a new stamp company, Whiff Of Joy, and is looking for some guest designers to join her really talented design team. 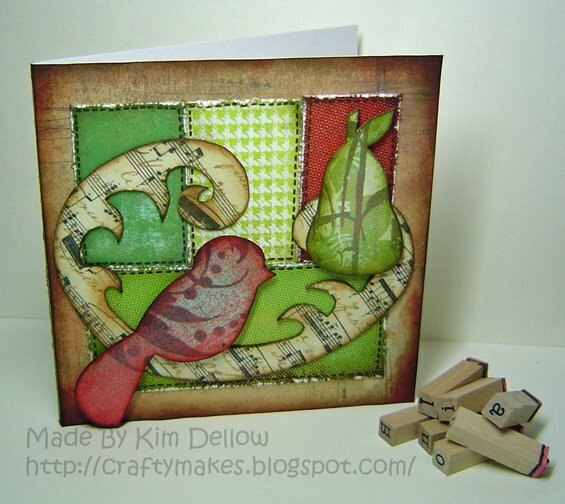 She has some fantastic stamps coming out designed by Elizabeth Beth and Alison Acton; you should go take a look at her blog: Katharina’s Creative Place. There are some sneak peeks at some of the wonderful stamps they plan to launch. Well, I thought I would submit a card for the design call 🙂 It would be fun to be a guest designer ,wouldn’t it?